I can’t resist dyeing eggs at Easter. I just like coloring eggs. 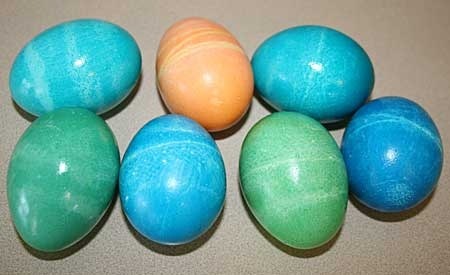 This year I used food coloring instead of packaged Easter egg dye. I kind of like this method. The colors seem to work out better and I can mix and adjust the colors the way I want them. The only problem was that I knew I had two boxes of food coloring. One is really really old. The other one is new. I could only find the old one though. It still worked well and had a handy color mixing chart on the back. The problem was I had only a drop or two of red. So I was limited to blues, greens, and yellows. I remembered where I put the other box later. I had put it in a box with some other fiber dyeing stuff. I also tried some of the decorating techniques on the Martha Stewart site I mentioned last time. I tried wrapping the eggs with lace and others with string. The string worked well. The lace was just too faint. Maybe I didn’t wrap it tight enough. Hey I had fun though. And no, I have no idea why I did mostly blue and green eggs, well other than the lack of red dye. On Easter, I went to see How to Train Your Dragon with a bunch of friends and then out to dinner. The movie was fun and a great way to spend the day. And because I admire Nathan Fowkes’ art so much, check out his blog post with some early color keys for the movie. The graphics and animation in this movie are wonderful. You can see some of his personal art in his other posts. I usually think of daffodils at Easter but this year I have an Easter Amaryllis. I’ve had this amaryllis for several years. It usually spends the summer on the front porch and I try to remember to bring it in after the leaves die and before it gets too cold. I was proud of myself this year, because I thought I brought it in just in time. It put out one leaf before Christmas and then stopped. Now I have a beautiful bloom. I thought it was because I didn’t store it properly but someone else in town said their amaryllis did the same thing. Zoe just had fun playing and rolling in the pillows on the daybed. 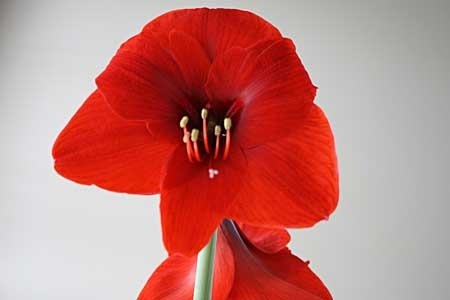 The amaryllis is gorgeous!! Bummer about not finding the reds until your eggs were done. Lovely eggs, even in blue and green! I love dying eggs, too!!!!! Love opening the fridge to a egg drawer full of colored eggs! Anytime of year! 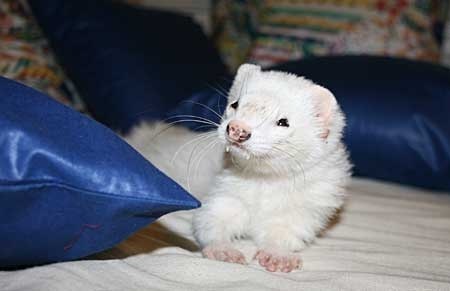 I bet the ferret kids would have a good time with some Easter grass! I do too! Dye just makes eggs more fun. The flowers are so confused, with all the hot and cold swings we’re having lately. I hope our weather evens out soon for their sake! I so admire your ability to experiment, even if things like the lace didn’t come out the way you wanted them too. I need to follow your example and not worry so much.